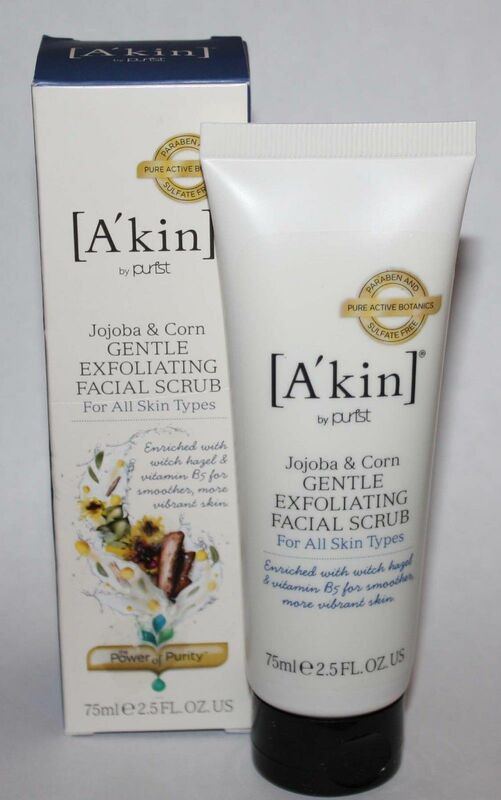 A'kin Jojo & Corn Gentle Exfoliating Facial Scrub gently refines skin texture by using jojoba and corn beads to help clear away sallow dead skin cells, leaving skin feeling silky smooth. Enriched with soothing witch hazel and vitamin B5, it prepares your skin to receive the maximum benefits from your A'kin moisturiser. how to use: Squeeze a small amount of Akin Gentle Exfoliating Facial Scrub onto your moistened fingers. Massage gently onto the face and decolletage concentrating on problem areas, avoiding the eye area. Rinse with warm water. Ingredients: Aqua (purified water), disodium cocoamphodiacetate (from coconut), lauryl glucoside (from coconut, palm & glucose), sorbitol (from GMO free maize), glycerin (botanical source), sclerotium gum, jojoba esters, zea mays (corn) cob powder, sodium cocoyl glutamate (from coconut & sugarcane), hamamelis virginiana (witch hazel) extract, glyceryl laurate (botanical source), sodium citrate (botanical source), sodium gluconate (from GMO free corn), citric acid (botanical source), sodium stearoyl lactylate (botanical source), methyldibromo glutaronitrile (and) phenoxyethanol, quillaja saponaria (panama bark), panthenol (pro-vitamin B5), sodium isostearoyl lactylate (botanical source), fusanus spicatus wood (West Australian sandalwood) oil, citrus aurantium dulcis (orange) flower water.